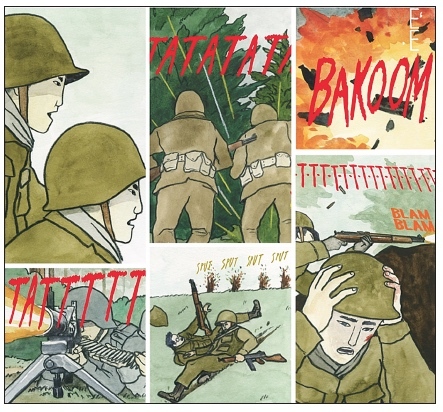 Against the contemporary backdrop of the immigration debate and family separation, of nationality-based travel bans and ultimately, the debate over what it means to be a loyal American, a trio of Japanese American artists has created “442,” a graphic novel that recounts the experiences of members of their families and of their community who served in the 442nd Regimental Combat Team, which became the most decorated unit in the history of American warfare for its size and length of service. Made possible by a grant from the California Civil Liberties Public Education Program, which supports projects around the incarceration of the ethnic Japanese during World War II, “442” follows in the footsteps of the Nisei soldiers who served as proof of their loyalty to the United States. Written by Koji Steven Sakai and Phinneas Kiyomura and illustrated by Rob Sato, “442” is available through the mobile phone subscription service Stela and will soon be available in a print edition in full color. Printed copies also will be made available to educators, librarians, museum directors and students to share this remarkable – and uncannily relevant – chapter in American history with a wider audience. Approximately 3,000 copies of “442” will be donated to Go For Broke National Education Center in Little Tokyo, which educates the public on the virtue and valor of Japanese American WWII veterans and their contributions to democracy. “Even though my father had been imprisoned in the camps, I was only vaguely aware of the 442nd until I was well into adulthood. When I dug into the details — with Koji and Rob — it was both exciting and saddening to learn this history,” Kiyomura said. Following the attack on Pearl Harbor, in February 1942, President Franklin Delano Roosevelt signed Executive Order 9066, which mandated that all Americans of Japanese descent as well as Japanese immigrants would be forcibly relocated to concentration camps, away from their homes on the West Coast. The 442nd consisted almost entirely of Japanese Americans, many of whom had been incarcerated and who had families who were still incarcerated. They had to answer a loyalty questionnaire, including: Would Nisei men be willing to serve in combat duty wherever ordered? And would they swear unqualified allegiance to the U.S. and forswear any allegiance to the Emperor of Japan? Ironically, the overwhelming majority of those who were asked these questions had been born in the United States or had lived there for decades. Most had never even set foot in Japan. Composed of 12 chapters, “442” chronicles in vivid detail the journey of the Nisei combat unit in the Battle of Vosges, one of the most dramatic and consequential battles in the European theater of WWII. The reader is transported to the Vosges Mountains in eastern France, amid the intense sights and sounds of battle as the 442nd carried out its mission of liberating the Texas 141st Infantry Regiment. The so-called “Lost Battalion” was surrounded by German forces and all but doomed. The 442nd broke through the German defenses and rescued more than 200 soldiers while suffering more than 800 killed or wounded. Ultimately, the 442nd was awarded 9,486 Purple Hearts, 24 Medals of Honor, and eight Presidential Citations. In 2011, the Nisei veterans were awarded the Congressional Gold Medal. “The World War II Nisei soldiers risked everything – most importantly, their lives – so that my family’s loyalty would never be questioned. I’ve made it my life’s work to make sure people honor and remember their many sacrifices,” Sakai said. Sato echoes this sentiment about the incredible sacrifices as well as the dilemma his family faced. “My entire life I’ve questioned whether or not I could have endured the injustice of the incarceration the way my great-grandparents did, or if I could have joined the 442nd like my grandfather, who fought for the country that put my family in prison for their race,” Sato said. Again, the parallels to searing contemporary issues are manifold, and Sato believes the re-telling of the story of the 442nd may provide much-needed clarity on challenges the country now faces.